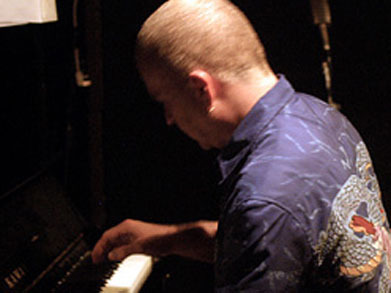 Brian Kellock is one of Scotland's world class performers, who is recognised as a stellar piano talent across the world.Brian plays in the Oscar Peterson/ Monty Alexander genre that is closest to his heart. Brian Kellock is one of Scotland's world class performers, who is recognised as a stellar piano talent across the world by musicians such as James Morrison and Michael Moore. Equally at home with mainstream and contemporary jazz styles, Brian plays in the Oscar Peterson/ Monty Alexander genre that is closest to his heart. His album Something's Got To Give, is a wonderful CD that shows off Kellock and his trio at their best in a fantastic set of standards popularised by Fred Astaire. Born in 1962 in Edinburgh, Brian graduated with a B. Music (Hons) from Edinburgh University in 1986. Since then, he has been establishing his position as one of the top piano players in the UK jazz scene, working with such luminaries as Red Rodney, Sheila Jordan, Art Farmer, Charlie Rouse, Bill Watrous, Scott Hamilton, Stanley Turrentine, Herb Geller and many others. From 1995, Brian has been a member of Australian trumpet wizard James Morrison's Band; touring all over Europe and Australia, and recording a live album for Warner Bros. at the New Morning Club in Paris, along the way. His main project is his own Trio, which first appeared as the rhythm section for seminal Scottish band, the John Rae Collective, as long ago as 1988. This line-up, featuring Kenny Ellis on bass and John Rae on drums, has been performing together ever since and has won them many fans. Finally, in 1998, the band released their first recording together - Something's Got To Give which has had rave reviews in the press. Brian was named as one of the Top 10 young jazz pianists in the world by Classic CD in 2000. His album Live at Henry's was released in July 2001 and has received rave reviews, and he is as a result now recognised as "probably the greatest pianist in the UK"
Brian Kellock is available for concerts; private functions; corporate and commercial events. A Selection of Jazz Standards and Original Material from one of Scotland's Finest Jazz Musicians.